After opening India’s 2012 box office with the international success Agneepath, Hrithik Roshan is ending 2012 on an even higher note. The actor has not only been working hard on his highly awaited Krrish 3 but he also had a world record attempt, some hot wheels and a very prestigious red carpet and festival event with some of his best films. Read on to find out more! 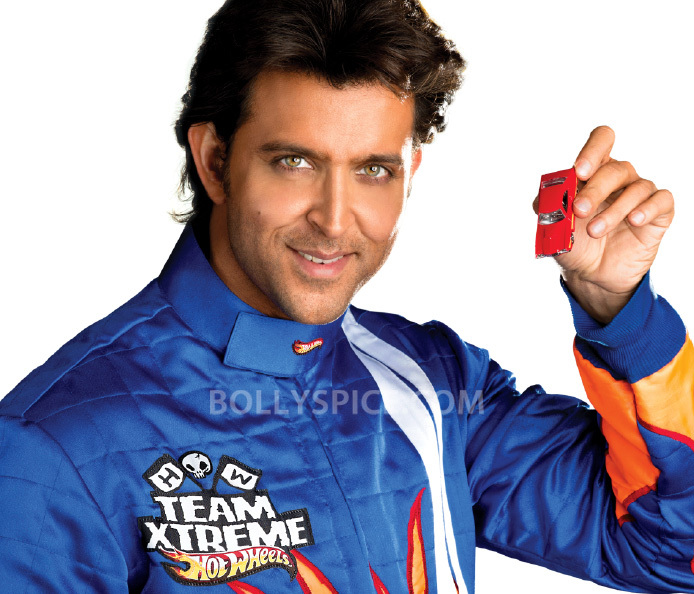 Hrithik was chosen to front popular manufacturer, Mattel’s ‘Hot Wheels’ toy cars. The actor has already shot various commercials and endorsements for the brand in Mumbai earlier this year. Not content with simply being ‘the face’ of the toy giant, Hrithik attempted to enter the Guinness Book of World Records on 4th December 2012 when he attended the event in India in conjunction with Hot Wheels to launch the world’s largest vending machine. Hot Wheels and Hrithik combined forces to launch a 25 foot play station called the ‘Hot Wheels Thrill Machine’. Walking a path of Carving his Dreams, Hrithik attended the 12th Marrakech International Film Festival in Morocco, as 100 years of Indian cinema was celebrated with viewings of classic films, including a special retrospective screening of Hrithik’s greatest silver screen moments, including Zindagi Na Milegi Dobara, Jodhaa Akbar and Agneepath. Morocco, which has a vast audience for Indian films, paid homage to Indian cinema’s greats, with a week-long celebration of the industry’s most iconic, popular and game-changing movies. Hrithik and wife Sussanne walked the red carpet at the opening ceremony on 30th November, as the film festival began with the biggest names in Indian cinema, both past and present, in attendance. Hrithik and Sussanne also attended the ‘Tribute to Indian Cinema’ segment on 1st December. The glitzy event saw Hrithik and his wife meet the Prince of Morocco, and later that evening the actor and his wife were guests at the prestigious royal dinner. While in Morocco, Hrithik and Sussanne also participated in a brand publicity photo shoot for their friend Christian Louboutin’s luxury shoe brand. The photos featuring the actor and his stunning wife will be seen in various top magazines across America. With par excellence acting skills, a striking Greek God persona, and a string of box office hits to his credit and several more anticipated, superstar Hrithik Roshan has earned himself much critical acclaim during his acting tenure. Hrithik opened India’s 2012 box office with the international box office success film Agneepath, which garnered rave reviews from critics and audiences alike and set the precedence and benchmark for 2012. With 2012 seeing an esteemed list of high profile appearances and collaborations, Hrithik enters 2013 with heightened anticipation for another blockbuster year. He will start the year filming Fox Star Studio’s Indian remake of the Tom Cruise and Cameron Diaz starrer Knight and Day with leading lady Katrina Kaif this Spring. The year will culminate with the release of his home production, Krrish 3, releasing on Diwali 2013. Hrithik’s profile will soar to greater heights as the 3D film sees Hrithik star as India’s much-loved superhero again. We can’t wait to see what Hrithik has in store for us! 16 queries in 1.297 seconds.